al-Akhbar (Beirut) reports that al-Qaeda in the Lands of the Levant, also known as the Support Front (jabhat al-Nusra), repeated scenarios it had previously acted out against other “moderate” remnants of the old Free Syrian Army. It launched a massive attack on the headquarters of Division 13 and occupied most of its position in the southern hinterlands of Idlib. The al-Qaeda fighters captured or killed dozens of Division 13 fighters, who had received CIA training in the use of TOW anti-tank munitions in bases abroad. Syria’s al-Qaeda reports directly to 9/11 mastermind Ayman al-Zawahiri, who now leads al-Qaeda. With the TOWs, al-Qaeda can now more effectively fight other rebels, or if they get time, the al-Assad regime. The dispute between al-Qaeda in Syria and US-backed Division 13 broke out about a week ago when civilian demonstrators against the al-Assad regime came out in Maarat al-Nu`man waving the flag of the civil Syrian revolution instead of the black banner of al-Qaeda. Al-Qaeda fighters attacked the demonstrators and tore up their flags, raising the black standard in their place. The night before last, violent clashes broke out in the northern neighborhood of Maarat al-Numaan between guerrillas of Division 13 and al-Qaeda fighters in which 6 were killed all together along with several being wounded. Then al-Qaeda, angered (and it is easily angered) attacked the HQ of Division 13. After a firefight involving a hail of bullets, al-Qaeda won and took over. Then the fighting spread to surrounding small towns, which also fell to al-Qaeda. As a result, al-Qaeda took control of a training camp and stores of American-supplied weapons including TOW anti-tank weapons. An al-Qaeda announcement tried to make Division 13 look like the aggressor here (Syria’s extremists must be studying the techniques of Donald Trump– always blame the other guy). Activists denounced the Freemen of Syria (Ahrar al-Sham), a major Salafi Jihadi opposition group, for not condemning al-Qaeda’s actions. The Freemen of Syria is part of a political coalition, the Army of Conquest, of which al-Qaeda is also a member. There have been several occasions on which the CIA “vetted” groups have been taken over by al-Qaeda, or in which US weapons leaked from Free Syrian Army remnants to militants. When Russia began bombing Syria intensively last fall, it concentrated on al-Qaeda positions and those of close al-Qaeda allies, and was condemned for this prudent move by the US and Europe, who said that President Vladimir Putin should have concentrated on Daesh (ISIS, ISIL). But it is al-Qaeda that is important in the western theater of the civil war. The US is to its shame more or less allied with the allies of al-Qaeda in Syria, as though Washington learned absolutely nothing from the 1980s in Afghanistan. Groups such as the Freemen of Syria ought to have to relinquish their al-Qaeda ties before being rehabilitated in Washington. And, imagine, all this happened because al-Qaeda couldn’t stand the civil revolutionary Syrian flag. 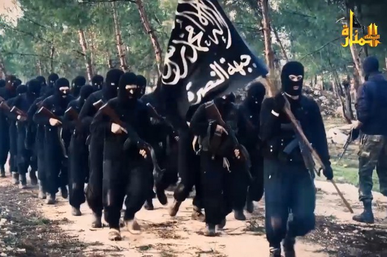 Al-Qaeda may have been emboldened by the current cessation of hostilities. But it should remember that Russia has exempted from that ceasefire two groups– al-Qaeda and Daesh.